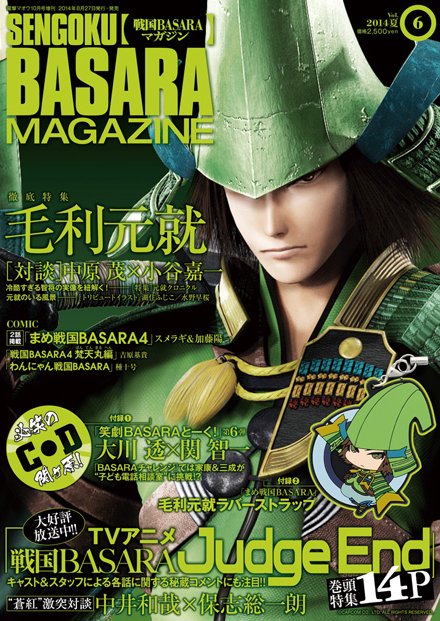 Although it will be a while before I received my copy and can post a full review, a little news is starting to appear online from people who purchased their copies of Sengoku Basara Magazine vol. 6 in Japan today. Amazon Japan accidentally leaked the cover a couple of days early again this time, forcing them to conspicuously switch back to the temporary cover until the magazine was scheduled for release. Unfortunately for them, plenty of fans had already seen the leaked cover before the coverup was complete. Motonari looks as serious as ever! The Dengeki Maoh staff have been teasing the release on Twitter too. There's a picture of Motonari's seiyuu and stage play actor eating those doughnuts together, a close-up shot of the Mame Sengoku Basara rubber strap, a shot which implies that at least some of the 'Motonari Chronicle' article is going to be about Sunday Mouri, confirmation of the contents of the talk CD and a glimpse of the interview between seiyuu Nakai Kazuya and Hoshi Souichirou. The official magazine website has updated with a few more small preview pictures. Twitter user @newyochan has posted a picture which indicates that Sakon will be the cover star of the next issue of the magazine, due for release on 27th November 2014. There will be a report from the upcoming Butai Sengoku Basara 4 stage play, a look back at Judge End and a rubber Sakon strap. The talk CD will feature seiyuu Nakahara Shigeru (Mouri Motonari) and Ishino Ryuuzou (Chousokabe Motochika). 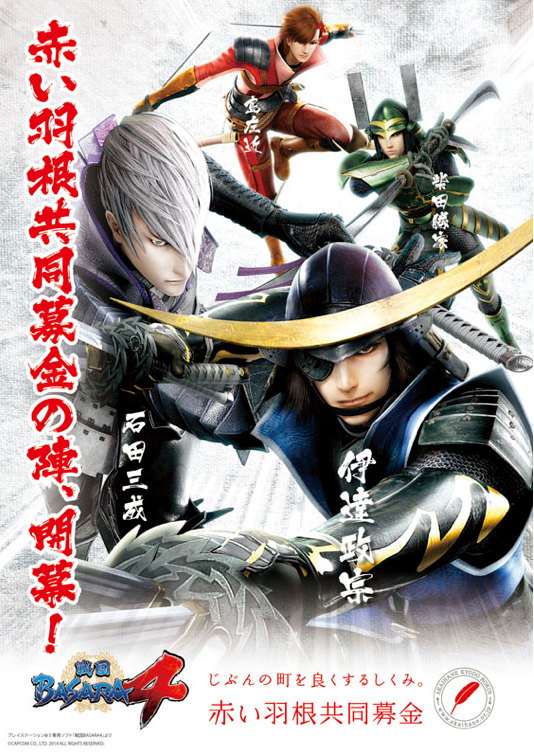 The serialised manga will include the same three titles again: Sumeragi's Mame Sengoku Basara 4, Yoshihara Motoki's Sengoku Basara 4: Bontenmaru-hen and Tane Jugou's Wan-Nyan Sengoku Basara. 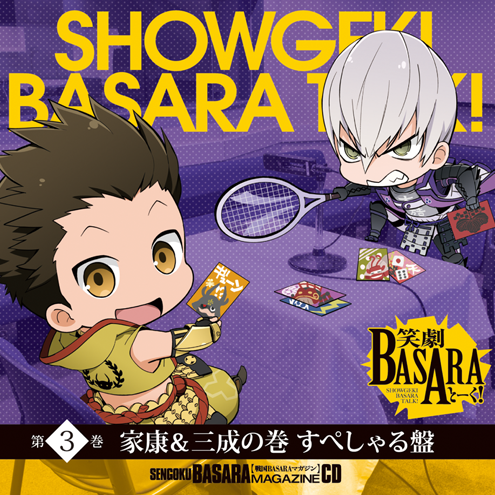 The final cover art for Sengoku Basara Magazine CD: Showgeki Basara Talk! Vol. 3: Ieyasu & Mitsunari No Maki Special-ban is now ready and it matches the style of the first two volumes. How cute! The CD's contents and release details are listed in this previous post. The Mame Sengoku Basara series continues to generate more merchandise in the form of a pair of new hanging scrolls featuring Shima Sakon and Shibata Katsuie. They're due for release on 27th September 2014 priced at ¥1,620 each. Charities are in the news a lot lately, and just like last year, Capcom have announced that they'll be supporting the Akai Hane Kyoudou Bokin ('Red Feather Community Chest') charity drive in Japan. This year's campaign will expand to cover 40 prefectures. 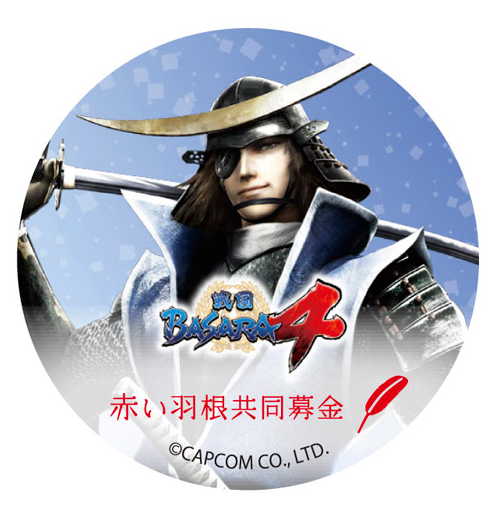 The exclusive rewards include tin badges and a clear file with the four Sengoku Basara 4 leads on the front and Ieyasu, Yukimura, Naotora and Shikanosuke/Oyassan on the reverse with information about the campaign. 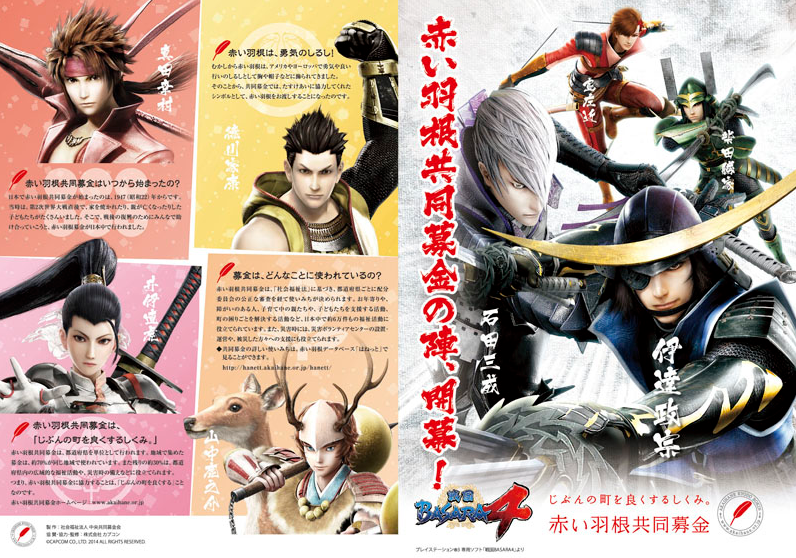 There's also a poster with the campaign's message and the four Sengoku Basara 4 leads, which will be made available for download as a smartphone wallpaper between October 2014 and March 2015. The recent Sengoku Basara avatars for the Japanese social gaming service Mobage were evidently successful as they're now releasing a second batch of customisable avatar costumes. Perhaps I'll be luckier in round three!